It depends on your hound, your teaching methods, and how you view your crate. Have you ever been in a polite gathering of greyhound adopters and adoption representatives? Inevitably, you find when the conversation turns to crating, the conversation may take on an adversarial tone. Someone says in despair, “Our newly adopted greyhound just hates being crated during the workday or being crated at bedtime. Why? After all, she should be used to the crate from her racing days. What can we do to make her accept the crate and be calm in it?” Hmmm. Could it be that these owners expect their newly-adopted dog to stay in her crate 10 to 12 hours because “she’s new to our home and can’t be left alone.” Do the owners believe that 10 hours really isn’t such a long time to not have a drink of water or to not take a walk to get rid of the muscle kinks? Or perhaps they think that, since she might have come from an adoption kennel situation where she was already kept in a crate 24/7 except to do her business two or three times a day (yes, there are such places), it’s acceptable to continue to let her wait. Does this couple want their dog back in the crate at bedtime too, after being in the crate during the day? Are they using the crate too long and inappropriately? Another adopter who views crates from the opposite end of the spectrum and believes that track dogs are basically crated 24/7 except for bathroom trips and a race or two a week (not true) adds in horror, “Greyhounds should never be crated. After all, they’ve been crated throughout their track lives for 23 hours a day. They are pets and family members now. Family members shouldn’t be crated, no matter what. Crating is too cruel!” Hmmm again. Perhaps the adopter has given her hound the run of the house from day one despite the fact that the hound was clueless about house manners. Perhaps she’s a lucky adopter who adopted the rare dog who fit right into the household and never did anything unmannerly. Perhaps this individual didn’t adopt the perfect hound, and she actually started out by using the crate to confine her unhouseworthy greyhound rather than trying to teach it the ways of the house. She discovered that when she uncrated the dog, it still didn’t “behave”, so the hapless hound went back into the crate, it’s adopter hoping for better behavior another day. She used the crate as quasi-punishment by confining the misbehaving hound rather than teaching it what she wanted it to learn. This usage confuses the dog, too, as it teaches nothing. The hound has no clue why she’s in the crate when she’d rather be elsewhere. Even worse, if the hound who behaves inappropriately actually prefers the crate, the tired, befuddled owner is reinforcing unmannerly behavior by crating the hound. This adopter may have given up the crate entirely, concluding that crating really doesn’t work. Her hound will be free, uncrated, and dangerously unmannerly because teaching her house manners is much more of a hassle than she expected. Expect this dog to be a bounce back. A third person chimes in with, “What’s the problem? 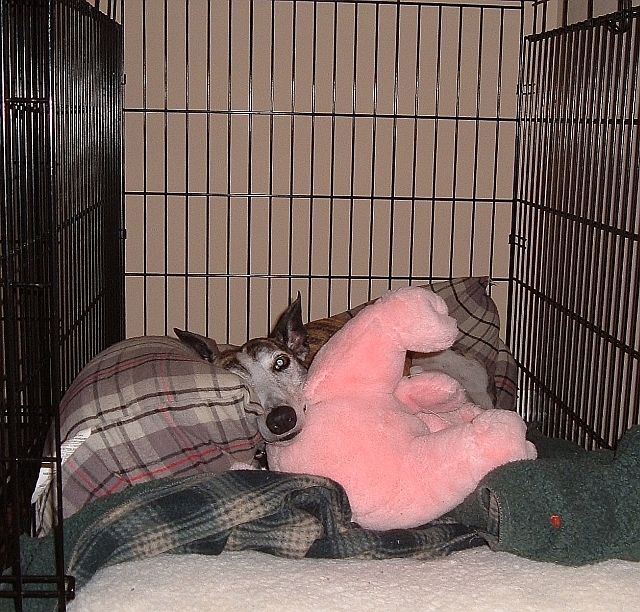 Our greyhound loves his crate and voluntarily spends time in it.” Another Hmmm. Perhaps this gentleman uses his crate as a traditional teaching tool, not overusing or underusing it, but using it judiciously to teach one wanted behavior at a time. This savvy couple knows that crates are best used for house training (i.e., to teach a dog proper house manners). They know the crate is unsurpassed for housebreaking (i.e., eliminating in an acceptable place, generally outdoors). They know the crate is the housebreaking tool to use if not using the classic method of keeping your dog tethered to your waist until it is housebroken and generally trustworthy. Additionally, they use the crate to protect both house and dog while teaching the difference between inappropriate chewing of animate and inanimate objects and acceptable chewing and playing objects. They know that injudicious crate usage creates a prison, not a school for learning house manners. When the training is finished the couple puts the crate away. Moreover, when these observant owners saw their hound looking for his crate (his den), they took it out of storage and put it where the hound and the humans could be together. Their dog is among those who had come to think of his crate as his refuge during his kennel days when living with 40 to 60 other dogs. 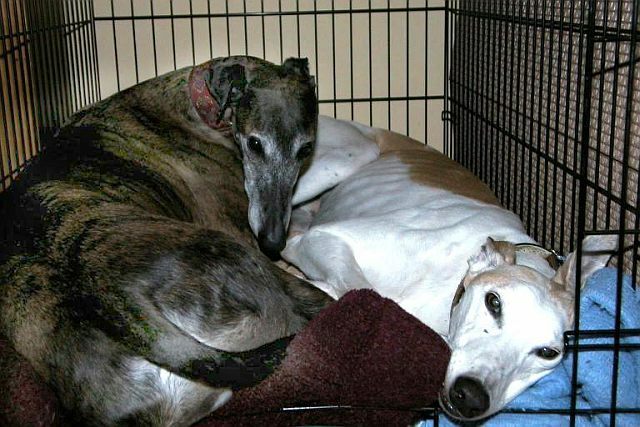 Once home, these hounds continue to see their crate as a comfy, padded den now – now one loaded with toys – where they can feel safe and be happy. How Long and When to Stop? Why do so many of us crate for so long – for hours and for years – in the first place? Probably because our adoption group told us we had to use a crate. The declaration “No crate, no greyhound for you” is a convincing argument for buying or borrowing and using a crate. The group may say, “Use it for a month. By then, the dog might be trained.” Trained in what? Other groups may give no time frame or guidance on how to crate train or on how to tell when the hound is house worthy. The new adopter is left to his own devices about how to accomplish this training and deciding when the crate is no longer necessary. Many adopters continue to use the crate out of habit and familiarity, not out of necessity. When to stop crating? Simple. Stop when the hound is housebroken and when it is house trained – when it is house worthy. How do to you know when that time is? By giving the hound the chance to prove it is housebroken, is finished chewing up the couch or the drywall, no longer gets into foods or substances that can sicken or poison, and is no longer interested in noshing on your antique dining room table. This may be frightening but it’s necessary. How about a test? If you’re not completely convinced that your hound is totally house worthy even though he shows signs of being so, why not try muzzling out of the crate? If, after a few trial home alone periods, nothing is amiss, why not try unmuzzling him for a couple hours in a safe room? Give him a chance to prove he can be trustworthy. Even setting up a video camera for fifteen minutes and leaving can prove very enlightening. See what happens – literally. How long it takes to teach those two major accomplishments depends on the dog and the dog’s teacher, generally the owner. Every dog has a different set of needs and a different time frame for learning house manners. Similarly, every owner has a different level of teaching skills. We have all heard Greyhounds who behave perfectly from day one, and we see people who can teach a behavior in minutes. We have heard of the other end of the spectrum. The dogs have separation anxiety, are shy or nervous, seem to delight in eating the house, are far too interested in the family cat or the toddler, and seem to take forever to housebreak. The owners aren’t as skilled in teaching wanted behaviors. Regardless of which end of the spectrum you and your dog live, the two main variables towards achieving success are you and your dog. Like any tool, a crate does its job efficiently when used correctly. Even better, odds are high the hound won’t be stressed out while learning house manners. Once the teaching tool has served its purpose, the adopter has a choice; he may put it away until the next project – his next newly-adopted Greyhound – or leave it out as an always available den and refuge. Worried about how your new greyhound gets on with your other pets? Rather than crating the greyhound and assuming the worst, how about considering gating the dog from a room where the cats or small dogs live? Start thinking of muzzles as face crates as well. If the dog is housebroken, the muzzle is the next step towards run of the house. Safety within a dog pack can be a huge concern. Three or more dogs equal a pack. The relationships and actions among these dogs are quite different from the relationship between two dogs. Another factor to consider is the pack stability. Can they co-mingle or are a couple jockeying for top dog position? Every time a foster dog enters a home with resident Greyhounds, there is jockeying for pack position. This may be harder on the residents than one would expect. Crating or muzzling might be in order. Is one of the dogs ill? If so, they may need to be separated either by gates, crates, and/or wearing muzzles. Which to do? Only the owner can be the judge of that and make that decision. Another good use of a crate is to keep the dog safe while at the veterinarian or while traveling. Let’s take a look at what we do, at what three respected non-greyhound placement groups do, and decide if we are really using crates properly. The Rat Terrier club states that appropriate time frames for crating dogs 17 weeks of age up is approximately four hours (six hours maximum) and that no dog should be left in it’s crate for the entire day (eight hours). Jacque Lynn Schultz of the ASPCA offers another take on time frame on the http://www.petfinder.org/website. She writes, “The rule of thumb for crating is no longer than one hour per each month of age, up to 9 to 10 hours maximum (the average work day). Each session should be preceded and succeeded by an hour of aerobic exercise.” She urges caution and suggests weaning away from the crate gradually. In other words, don’t decide to keep your dog in the crate for 10 hours one day and allow him the run of the house for 10 hours the next. Staying home to accomplish this may mess up your work schedule, but it might be an ideal thing to do when you take a stay-at-home vacation.